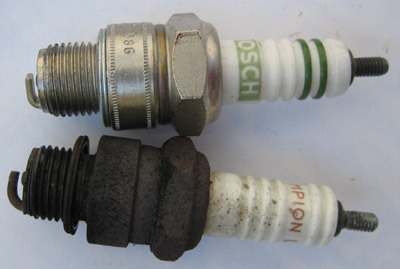 The spark plugs do a lot of work - setting fire to petrol thousands of times a minute for you whenever you're driving. To work properly they need to be clean, and have the right gap for making their spark. You should check the spark plugs once a year, or every few thousand miles, whichever comes first. We're going to find the spark plugs, take them out, clean them and check their gaps. If they're really bad we're going to replace them with new ones. 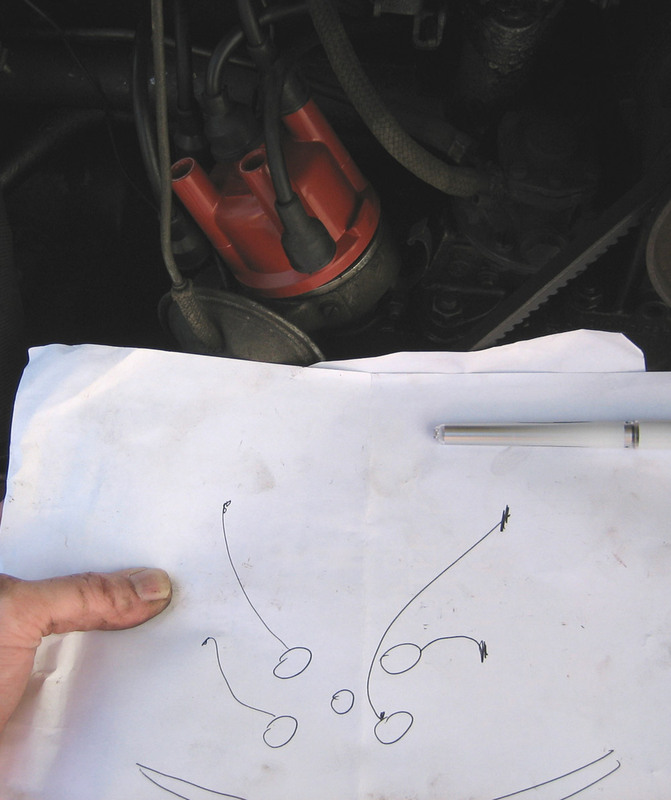 Spark plug sitting on top of the relevant diagram in the John Muir 'How to keep your Volkswagen Alive' book. Open up your Volkswagen's engine bay and have a look inside. On the back of the engine is a squat cylinder sprouting cables - this is the distributer cap, the cables are HT leads. On the other end of the HT leads are the spark plugs. Follow the leads to either side of the engine and find the end of one of them. Pull back on the end firmly - there should be a bulky part near the end so you aren't pulling the lead itself. This is fiddly and some plugs are difficult to get at. Try not to get too frustrated. If they don't come out with a bit of firm pressure, try tightening them just a little, then loosening them, this can help break any rust that's built up around the thread of the plug. Also you could try putting a few drops of oil or a spray of WD40 and leaving it to soak in for a few minutes, then try loosening them again. Usually the main problem is getting the tools in the right place rather than them not loosening off. Extracting the back left spark plug with socket wrench. Now you have the spark plugs out, are they dirty? As we can see from the picture, it's been way too long since I last checked my spark plugs and they are very dirty. I need to clean them with a small wire brush to get them in to a better condition. All this soot means they won't be sparking as efficiently as they will when clean. 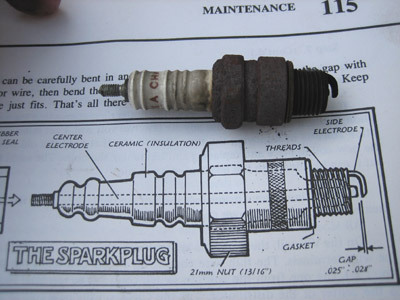 The gap in the spark plug needs to be the right size, otherwise it can't spark properly. The spark makes the petrol go bang, which drives the pistons up and down, which pushes you forwards, so without the right gap, you're not going anywhere. 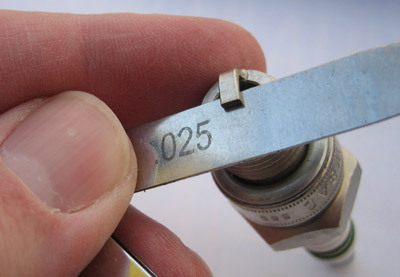 The correct gap is between 0.025" and 0.028". To get that right you'll need a thickness gauge (also called a feeler gauge). Find the right (or nearest) blade and fold the rest away. 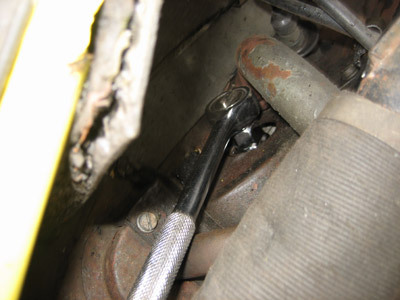 Put it in the gap below the hook at one end of the spark plug. It should just slide in and out without getting held by the plug. Fortunately, the gap on my new plugs is fine - just over 0.025" and the blade slides through the gap quite easily, without being too loose. Once you have clean, or new, spark plugs, you need to fit them. It's generally a good idea to put a quick spray of WD40 on the thread of the spark plug to help it seat well in it's socket. Screw them in by hand until they are 'finger tight' - i.e. you can't easily tighten them up any more. When you put them in the socket, try not to knock any dirt down the hole, as that's dropping in to the engine. Also, if the plug isn't going in easily, unscrew it and try again, don't try to force it. 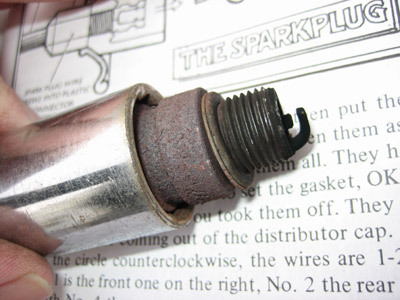 Once they're finger tight, use your spark plug tool / socket to tighten them just a little more. You want them to be properly seated so they won't rattle loose, but not so tight you can't get them out again. Once again, if the plug doesn't go in relatively easily, don't force it, you don't want to strip the thread of the socket as that'll mean getting the engine out to sort the problem - definitely not good. Finally, you need to re-attach the HT leads to the spark plugs. It's important to get these the right way around, as the firing order of the plugs needs to be correct or your car will at least mis-fire, and likely not go anywhere at all. Below we can see the diagram I drew before taking the leads off. The left hand leads are easy - the top left lead coming out of the distributor cap goes to the top left spark plug. The bottom left lead from the distributor cap goes to the bottom left spark plug. The right hand leads swap over, so the top right lead coming out of the distributor cap links to the bottom right spark plug. 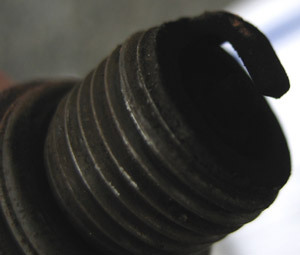 And finally the bottom right lead coming from the distributor cap goes to the top right spark plug. Hopefully, everything will be fine and you can enjoy the extra performance and smooth running clean spark plugs gives you.